With the biggest party of the year coming up (aside from my son’s yearly birthday bash), I started thinking of fun ways that we could celebrate the ringing in of the new year in kid-style. 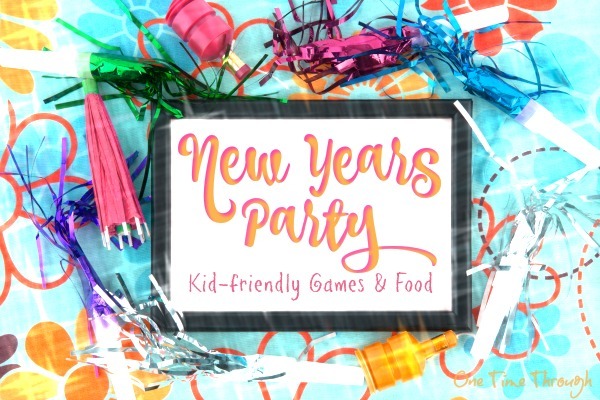 Are you looking for fun family New Year’s party games and food ideas for the kiddos too? You’ve come to the right place! This post contains Amazon Affiliates Links, as well as a paid link. Please see our full disclosure policy here. My friend Sofia is Greek and always has awesome ideas for celebrating. The Vassilopita money cake she makes every year is always a huge hit with all our kids! (see below for the description). She inspired me to research traditions from around the world – and I found some pretty fun and wacky ones! I’ve used them as inspiration to create 9 fun games you can play with the kiddos and a handful of fun food ideas. You’re going to love these games and who knows…maybe they’ll even bring you and your family luck, prosperity, peace and happiness in the coming year! Enjoy! Inspirational Tradition: Exchanging sprigs of mistletoe was once thought to bring the receiver good luck for the new year. Preparation: Get a sprig of real or fake mistletoe. The New Year places the mistletoe in front of him/her and closes his/her eyes. Then they take their place in the circle again and the New Year opens his/her eyes. Everyone in the circle places their hands behind their back (including the person with the mistletoe) and the New Year has 3 chances to guess who has it! Want to make the game more difficult? Have the players in the circle pass the mistletoe around from person to person behind their backs. If the New Year guesses the right person, that person becomes the new New Year! If they don’t guess correctly, they choose someone to take their place in the center of the circle. Inspirational Tradition: Some Puerto Ricans roll a coconut through their house and then into the ocean to cleanse away evil spirits from the house and bring good luck. Preparation: Buy a coconut for a bowling ball. 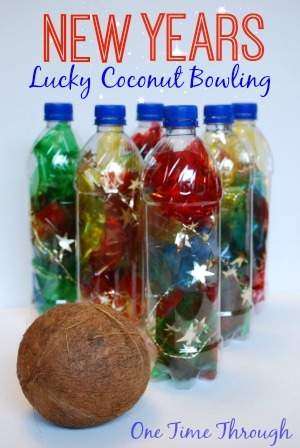 Make some bowling pins (between 3 and 12) out of empty pop bottles or plastic eggnog bottles with the labels removed. To make our bottle pins look festive, we crinkled up some coloured cellophane and added some star garland wire. Number them if you wish. How to Play: Find a long hallway or room and set up the pins in a triangular shape and have the kids practise rolling the coconut to knock over the pins. You can keep score, or not at all! But you’ll have an evil spirit-free house after! Onetime had a blast with this game and we even ended up using the pins for a fun obstacle course when we were done bowling. Oh, and it’s okay to eat the coconut too when you’re all bowled out! Inspirational Tradition: Watches and clocks are used as decoration to mark the holiday. Preparation: Get 2 coins of any type and a clock with a second hand, or a timer. How to Play: Gather all players (but two) to sit in a long line. Everyone should sit holding the hands of the players on either side of them. Pick a chosen “leader” to flip a coin at the start of the line. If the coin is a Heads, the line person will begin a squeeze that passes down the line from hand to hand. If the coin is flipped to a Tails, no squeeze is started and the leader should flip the coin again. The idea of the game is to repeat it to see how fast the group can get at passing the squeeze! After the game is done, give the coins away to the children for good luck! We thought this chocolate drop looked like a capital E – predicting Excitement for the new year! 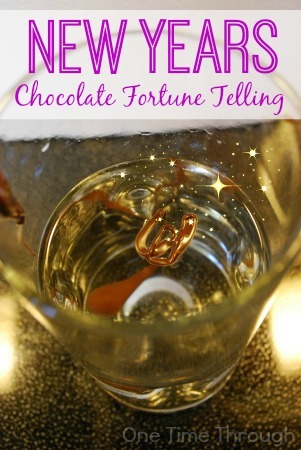 Inspirational Tradition: Referred to as “Bleigießen”, in this traditional fortune telling activity, a spoonful of molten lead is dropped into a cup of cold water, then watched to see what shape it takes as it cools. Different shapes predict different things for the new year. Our version uses melted chocolate instead of lead! Yum…and thank goodness! Preparation: Buy a package of chocolate chips, and a cup and plastic spoon for each child/participant. Melt the chocolate in the microwave or using a double boiler, or fondue set. A circle or sphere (looks like money) can mean prosperity, a star shape can mean fame, strings can mean there will be lots of music in the new year. An airplane shape or rectangular shape (luggage) can mean travel. Make up some fun predictions on the spot like we did above! The bonus part of this activity is the kids can eat their chocolate when they’re done! A guaranteed pleaser! Inspirational Tradition: Play card and dice games on the luckiest night of the year. Preparation: Get 6 garbage bags and label each with one number from 1 to 6 using permanent marker or acrylic paint. Find a large plastic/foam die. How to Play: Spread the numbered bags on the floor of a large space. Choose someone to roll the die. Whatever number shows up, means that everyone should move to that garbage bag and try to stand on it with both feet. The last person to fit or get there, gets to roll the die the next time. This is a cooperative game that will get everyone working together and laughing! Play as long as you want! Inspirational Tradition: Wearing polka dots on News Years brings prosperity because they are round like money. Preparation: Buy approximately 3 wooden clothes-pegs per game player. Use a marker to draw a coloured circle on each peg. You’re ready! How to Play: To begin, each player must clip 3 clothes pegs onto their clothing somewhere. Remind players not to clip near private areas or in hair/hairbands – or anywhere they don’t want to potentially be grabbed by accident! All clothes-pegs must be visible and not hidden under clothing. When the game begins, everyone tries to steal clothes-pegs off other players while keeping their own. The game usually ends after a certain time limit like 2 minutes – when everyone counts up their pegs to see who collected the most! The person with the most is declared the luckiest person for the new year! Play as many rounds as you like – starting with 3 pegs again each. I’ve played this game with many of my students – be prepared for lots of action and lots of laughing! 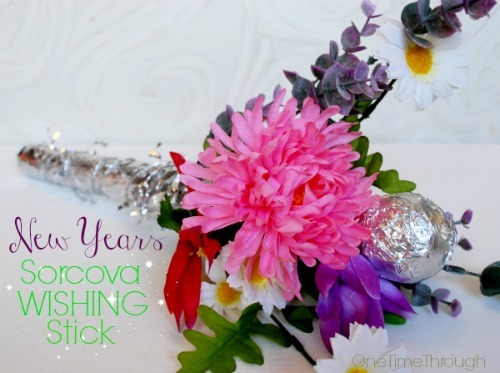 Inspirational Tradition: Decorate a stick (the sorcova) with brightly coloured artificial flowers and tap others with it while wishing them good luck for the upcoming year. The sorcova stick is supposed to impart health, youth and fertility! Nice! Preparation: Make a sorcova wishing stick by winding fake flowers around a colourful cardboard roll (we used a tinfoil roll which is smaller and sturdier than a paper towel roll, and covered ours with tinfoil) or rolled up bristol board paper. Secure the flowers with silver duct tape. How to Play: Gather everyone into a circle. Choose one child/adult to start in the center of the circle with the Sorcova Wishing Stick – we’ll call them the “Well-Wisher.” The Well-Wisher chooses someone in the circle to approach and they choose to say either, “Well wishes to you!” or the child’s/adult’s name. After the Well-Wisher has said their choice, the person in the circle has to respond. When the Well-Wisher says, “Well wishes to you!” the circle person has to respond by saying their own name. With young children, it’s best to just practise the above call and response for a little while so they understand how it works. After all the kids understand what to say, you can add in the exciting part! Now, after the Well-Wisher says the name or “Well wishes to you!” they tap the chosen circle person gently on the foot or knee with the Sorcova Wishing Stick. You will need to remind the kids that they cannot tap and say the words at the same time. If the Well-Wisher can tap them before they respond – they switch places and the circle person becomes the new Well-Wisher and takes the Wishing Stick. Confused yet? That’s okay – just read the above a second time and you’ll get it. Trust me – kids LOVE this game! Play the game until everyone has at least been well-wished once! Or as long as the kids like! Inspirational Tradition: Dancing & singing throughout the night. Preparation: Get some fun party music and an music player. That’s it! The Dance Monitor looks to find the first person who moves or freezes last the next time the DJ stops the music. When the Dance Monitor catches someone moving, they call out, “Happy New Years to [name of person who moved]!” and that person becomes the new Dance Monitor for the next round. Then the old Dance Monitor returns to the dance floor! Inspirational Tradition: Ice Cream Fights! Yes – it’s true! Preparation: Make yourself a pom pom “ice cream” shooter for each player in this fun and active game. We found the instructions for these awesome shooters in the new book 150+ Screen-Free Activities for Kids. You can read about how much fun we had using them in this post. How to Play: You can play this game two different ways. The first way, everyone starts with a shooter and a large “ice-cream” pompom each. Everyone chases everyone around trying to tag each other by shooting their ice-cream pompoms at each other. No keeping score, no one is “it” – just pure non-messy ice-cream fun! In the second version, one person can be It and they hold the shooter. They chase the others around and try to “tag” them with their ice-cream pompom by shooting it at them. If someone gets tagged, they become It. If you like this idea of pompom ice-cream, then you might be interested in creating a Pom Pom Ice Cream Shoppe Sensory Bin for toddler/preschooler play at your party. You could even have a real ice-cream shoppe for treats after! 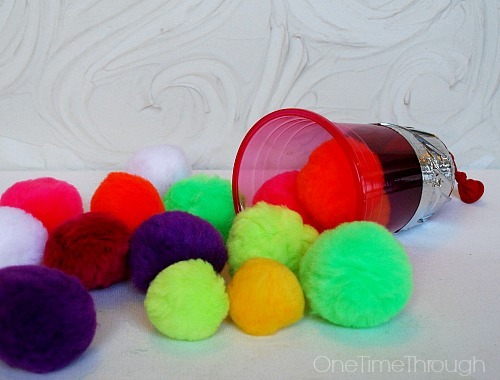 OR, you can even use these pompom shooters to shoot up confetti at the end of your countdown. Looking for even more fun game ideas for the holidays? Check out this fun infographic full of simple DIY games created by Internal Doors. DIY: Party Games! – An infographic by the team atInternal Doors. When the kiddos and friends are on a break from games and need some munchies – here are 4 fun food ideas (with cool traditions) from around the world! One of my favourite new years traditions that my friend Sofia introduced to me is the Vasillopita. 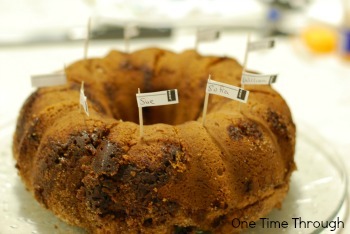 Basically, you bake a cake with a foil-wrapped coin hidden inside. At midnight the cake is sliced into pieces for everyone and whoever finds the coin in their slice, gets extra luck for the whole year! My friend Sofia says that if you get the coin, you must keep it safe all year for the luck to stay with you. Alternately, you can do what they do in Spain and bake a ring-shaped cake (extra lucky shape) and fill it with foil wrapped money and metal charms, so that everyone gets some luck! In Italy, gifts of honey are thought to bring peace and sweetness to the new year. Why not try this healthy snack? Slice up a few bananas, pour some honey into a bowl, and wheat germ onto a plate. Provide forks. The kids will enjoy dipping the banana slices into the honey and then into the wheat germ, and into their mouths! My son LOVES this snack! And enjoy some peace and sweetness – at least while the kids are eating! Eat 12 lucky grapes (Spain) or raisins (Portugal) at midnight (or whenever you choose to celebrate the new year with your kids). The idea is to make a wish with each grape/raisin for each of the coming 12 months. To get the kids excited about making toasts, why not set up a fun drink-making station for them? 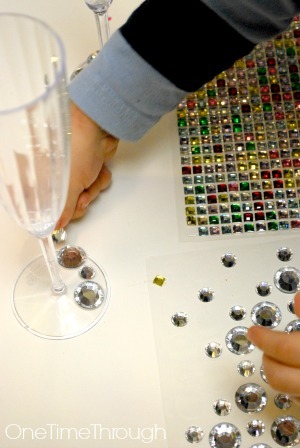 Buy fun plastic glasses that look like champagne flutes, have the kids decorate them with stick on gems. Onetime liked his flute so much he was thrilled to drink water in it! Pick up some coloured straws and provide different sparkling grape juices, orange juice, ice creams or rainbow sorbet to add, and maybe pop. If you want to go traditional, invite the kids to make a punch out of grape juice (red and white), cinnamon, and sugar like they do in Austria. 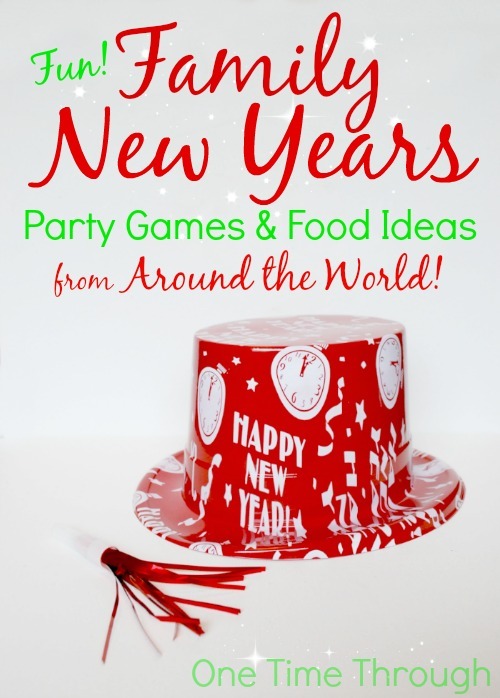 That’s it for our fun Family New Years Party Games and Food Ideas from Around the World! Did you find some ideas to try to make your party extra fun this year? Do you have any other great games to share? I’d love to hear about them below! Leave a comment. If you’re looking for even more New Years ideas, be sure to check out our Pinterest board:Follow One Time Through’s board New Years on Pinterest. To find even more positive parenting tips, follow me on Facebook and Twitter. You can also find me on Pinterest! To a lucky, peaceful, and positive New Year! Wow! This is awesome! My daughter loves to learn how others celebrate from around the world. Can’t wait to try some of these on New Year’s Eve and also sharing in our New Year’s round-up!